This is my daily paint works challenge piece for the week. The challenge is to paint white on white. May tweak the shadows a bit before I call it finished! Oh, this is just perfect, Maria! The lights and darks are so beautiful, so much light and volume with such crisp colors. Great work! Thank you Blaga. This was such a great photo from a beautiful (but cold) winter day, it made the painting easy! Well done, Maria! You have got some wild colors in there, and I love it!!! Kathryn, so much easier to be brave with colors when painting for fun, and not a portrait for someone, if I don't like how it turns out, I don't have to show anyone! Superb use of colors and this horse is just perfect! Wow Maria, this is a fabulous painting! Wonderful colors! Love this painting!! Beautiful in every way! Wow, Maria, this is so beautiful!! I love the horse's face and the blues and violets on the horse. The way you did the snow is awesome, too! I basically love everything about this painting! beautiful can see your love of animals maria ..thankyou for visiting my blog ciao jane. Thank you Theresa and Jane! I had a beautiful model to paint from, and the perfect winter sunshine. Gorgeous. 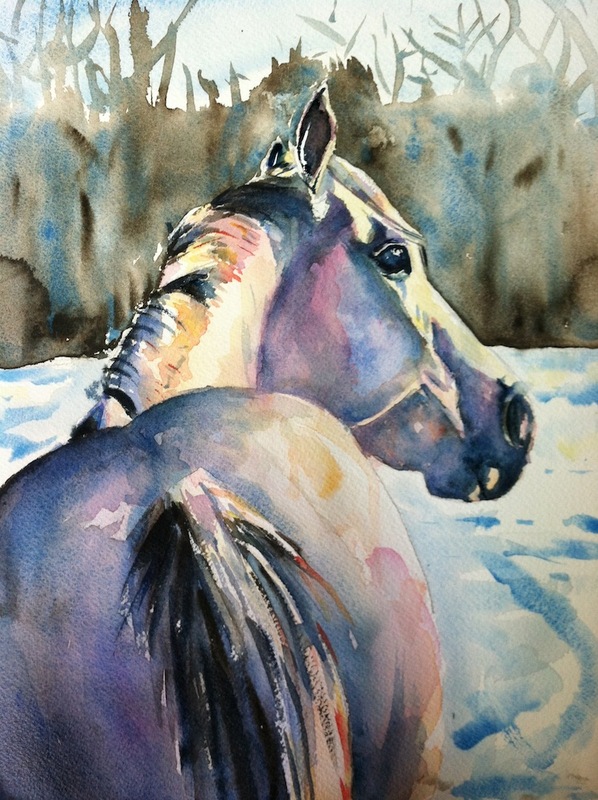 I love the horse's pose and your drawing of it, and, of course, all the many colors you found in your subject. You really nailed this one! I love the understatement of the background, and the beautiful colors on the horse! Thank you Laura and Arena, I really appreciate your feedback. Beautiful, Maria! Love the shadows, too- you did a great job on the snow! Wow Maria - over the top! gotta enter this one in some contest - its a prize winner! oh boy Maria this is beautiful, love all the colours and you know it's white. oh thank you! 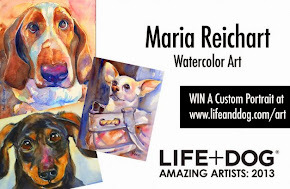 I really admire your work as well, especially your paintings of dogs, so beautiful. Thank you Pat! Now I feel pressure to keep up the standard, I best get back to painting! Hi Maria - my iPad won't bring up the movie for me, so will have to get DH to bring my laptop to me for your latest post. I love, love, love everything about this painting!!! The color, the composition, the emotion. Your balance of value is incredible!